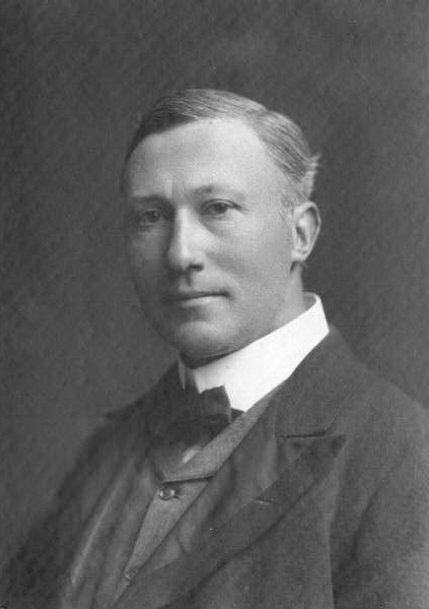 Sir Samuel Keightley was a considerable figure in public life in Ulster in the two decades before World War One being prominent in “Liberal” Unionist politics. He was also a practising barrister; and had a parallel, literary career, publishing several best-selling and acclaimed novels, and some poetry; the novels were mostly based on real historical events and people. He was born in Belfast, eldest son of Mr Samuel Keatley (sic), JP, who had a successful clothing business in Belfast, served on Belfast Corporation and was a Water Commissioner; and Catherine Brennan. He attended Queen’s College, Belfast, where he had scholarships in both law and classics, and graduated BA in 1979, LLB in 1882 and LLD in 1884. He appears to have worked in a junior post in the College library at that time. In 1883 he had been called to the Irish bar, and decided to confine himself to the North East circuit, which was unusual at the time, though it does not seem to have hindered his career. Early in the new century he joined the Ulster Farmers’ Union, which soon became the Ulster Farmers’ and Labourers’ Union and Compulsory Purchase Association, of which he was one of two joint secretaries along with Thomas Russell, Unionist MP for South Tyrone, who had been initially more sympathetic to landlords’ rights but the more he became acquainted with his Presbyterian farming constituents (as opposed to Anglican landowners) and their increasingly bleak financial situation, the more he determined to get rid of the landlord class comprehensively through compulsory purchase. (Russell’s father, a stonemason in Scotland had once been evicted.) Though firmly Unionist, their independent stance on the land question appealed to some small (Presbyterian) tenant farmers but also to nationalists (at this time the “National Question” was closely tied to the issues of land as well as to the ever-pressing constitutional question of Home Rule). Keightley stood in two elections as a “Russellite” Unionist, unsuccessfully in both case, in South Antrim in 1903 and South Derry in 1906, in the latter by 71 votes. In 1910 he stood again in South Derry, with no more success. By this time he had joined the Ulster Liberal Association and founded a newspaper, the Ulster Guardian, a weekly which described itself as printed “by Trade Union Labour” and appeared until 1920. In 1911 he was appointed to the Senate of the (new) Queen’s University, as one of the four Crowns nominee, another being the well-known and staunch Liberal Unionist Rev JB Armour of Ballymoney, who He was a very active and effective member of Senate, though when his term expired in 1914 he was not re-appointed, perhaps as he had suggested the University pass a resolution in favour of Home Rule during the crisis of 1912, or as he put it, the University should show solidarity with “the main current of national life and development”. This was not congenial to a University with a distinct Protestant/Unionist flavour. A principal fear was that Home Rule might adversely affect the new institution’s funding He ceased to involve himself in public life after this. Already when nineteen years old he had published A King’s Daughter and other poems, the title poem of which appears to have been written when he was just 16 years old. His first novel was published in 1894: The Crimson Sign was set during the legendary Siege of Derry of 1698, when the city was besieged by the Catholic King James II. The novel appeared in four editions by 1906 and was reviewed enthusiastically by such organs as the Guardian (“a thoroughly good work”), Vanity Fair (“it does not contain a dull page”), and the Glasgow Herald (“narrated with great, though unstrained, dramatic force”), among others. The Cavaliers followed in 1895, a tale set during the English Civil Wars of the 1640s. The central character of this story, Dunscombe, becomes involved in various (unlikely) intrigues including smuggling letters from King Charles I to Queen Henrietta Maria and a scheme to help the King escape from Carisbrooke castle on the Isle of Wight (where he was in fact imprisoned for over a year before his execution, which took place on 30 January 1649). The King appears in person in the novel: the first time he is described as having a “Worn, pale face and the fire of indignation balzing in his eyes – the piteous picture of falling majesty”; later, shortly before ihis execution, his frame is “bowed and wasted, his cheeks were drawn and almost death-like in their pallor.” He also is involved with Cromwell, rescuing him when he attacked at an inn. The novel ends happily, its last page features Cromwell who pardons Dunscombe and even produces his old girlfriend for him in person. The last recruit of Clare’s, about the “Wild Geese” (soldiers exiled from Ireland who became mercenaries in continental Europe) was published in 1897 in both London and New York, evidence that he had won a transatlantic readership. The Silver Cross followed in 1898, set in Paris at the time of Cardinal Mazarin; this he described as a “Romance”, though in the contemporary sense. It was another success, with its lettres de cachet, its masked ladies, and its derring-do – one chapter is entitled “How we took the Bastille”. 1899 saw Herenford, a rather Gothic tale, also a “Romance”, with language very much of its time – the introduction mentions “horns of elfland” and evokes “Arabian Nights” tales, though it is set in a rather spooky manor house in eighteenth-century rural England. Herenford seems not to have been as commercially successful as it did not run to more editions. This was also true of A Man of Millions which was published in 1901 and had a contemporary setting and a plot featuring a treacherous Chinese servant who tortures his employer, the title character who had made a fortune in South African diamond mines, in an attempt to get his hands on the fortune in question. Archie Spence gave a hunted man twa nichts’ lodgin’ - his guid woman is a kin’ ov cousin ov my ain - an’ noo they’re payin' him fur the kindness that he showed me - harberin’ rebels they ca’ it. The white-heidit bairns are oot on the roadside noo, an’ the bonny roof-tree that shud be as sacred as the wa’s ov a palace are jist a wheen ov charred sticks... before ye gang tae bed this nicht ye'll see how Britain trates the honest men ov Ards, shud I hae tae carry ye ivery fut ov the road myself. The Pikemen was successful, running to four editions by 1906, and in 1936 the Irish Free State government commissioned a translation into Irish as Lucht Pící a's Sleagh . This was reviewed in June 1938’s Catholic Bulletin, which praised it (though the reviewer was not able to resist the assertion that the United Irishmen of County Down in 1798 “were the ancestors of the folk in whose name Partition is perpetuated”, a petite jérémiade not untypical of the time). Chapter twenty-four is probably the central climax of the work with its account of the battle at Ballynahinch on 12-13 June, initial successes of the rebels followed by a reversal, rout and lynchings by British government forces, the Hillsborough Yeomen. The narrator is chased and captured. A brutish Yeoman sergeant identifies him as a “damned Presbyterian” and is about to hang him and a comrade, but the comrade asks an arcane question, the sergeant turns to ask one of his men and, and Stirling’s comrade is able to escape. Stirling has the noose around his neck, though, but a shot from seemingly nowhere kills the sergeant and Stirling survives. Keightley as public servant was knighted in 1912. His first wife was Gertrude Smith, originally from Northampton, England, who had a busy career of her own. They had two sons and two daughters. Captain Philip Charles Russell Keightley served in the Royal Garrison Artillery survived through the Armistice, though he died in 1919 of a respiratory illness, which was thought to have been caused by his having been exposed to poison gas; his name appears on the memorial window in Railway street Presbyterian Church, Lisburn, as one of those “who laid down their lives in the Great War”. After his death, his father edited and published with a lengthy introduction Among the Guns: Intimate Letters from Ypres and the Somme, a collection of his letters home from the front. His father acknowledged that his son had not intended to publish them in their raw form but was intending to prepare them for publication; “they reflect the mind of the writer at the moment. They are the instant picture of the scene painted in living colours while the mighty drama was slowly evolving... They are a chapter, however insignificant, in the history of the Great War which the formal historian does not touch.” Of the other children, Lieutenant Maurice F. Keightley trained for the Indian Civil Service before his commission and survived the war. Katherine (Rosenfeld) married in Belfast but moved to England. Patricia married Brigadier Norman Douglas Wingrove of 10th Ghurkha Rifles. The first Lady Keightley died in 1929. Keightley remarried in 1930 and soon moved from Ulster where he had lived at a number of fine residences, Fortwilliam Park in north Belfast, Mount Pleasant, in the Malone-Stranmillis area of south Belfast; and Drum House, a large dwelling at Drumbeg, a few miles to the south of Belfast, among others. He disappears from the street directories in 1931 to spend the rest of his life in southern Ireland, dying at Grattan Lodge, Naas, County Kildare.